February 10 marked the first day of the Chinese lunar year of the Snake. It was a spring day with chilly rains, and there were not many pedestrians out on the streets in London. Trafalgar Square, however, was filled with a festive atmosphere with the beating of gongs and drums and the deafening sounds of firecrackers going off. 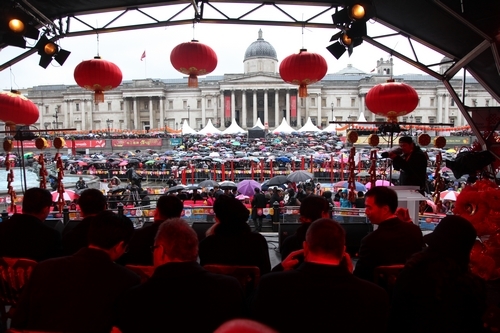 In spite of the rain, more than 500,000 British citizens as well as tourists from around the world gathered at the square and cheerfully participated in the Chinese New Year celebrations which were jointly hosted by the London Chinatown Chinese Association, Greater London Authority and Westminster City Council. 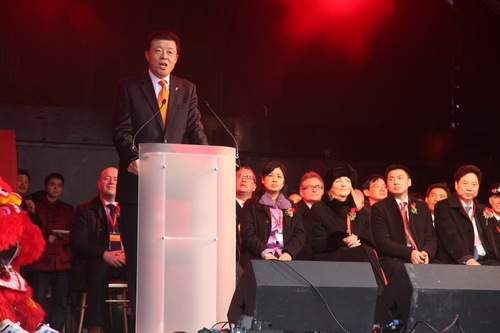 In attendance at the event, the official guests included Ambassador Liu Xiaoming, Deputy Mayor Munira Mirza of London, Councillor Philippa Roe of Westminster, Member of Parliament Frank Field and representatives of the Chinese community in London, who each delivered speeches at the Opening Ceremony. In his speech, Ambassador Liu said that according to the Chinese lunar calendar this year is the Year of the Snake. In Chinese culture, the snake symbolizes longevity, productivity and prosperity. He wished all the guests present good health, successful careers and good fortune throughout the year of the Snake. He said it was the very first day of the first lunar month, a time when the old year comes to an end and the new one starts. For over four thousand years, Spring Festival has been the most celebrated and ceremonious festivity in China. It is a time for family reunion, a time to replace the old with the new, a time to wish for a bumper harvest and a time to pray for good fortune and happiness. The most common custom during Spring Festival is to give new year’s blessings and wish each other the very best wishes. Following these remarks, Ambassador Liu gave all the distinguished guests his new year blessings and wished everyone a prosperous and happy new year! 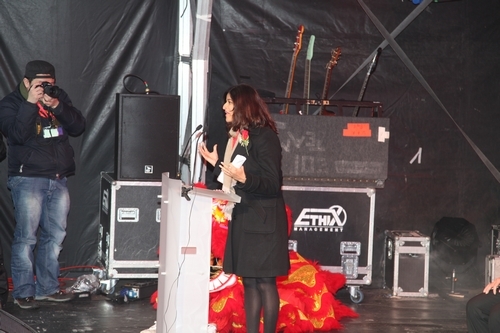 The Ambassador pointed out that Spring Festival is also one of the happiest days of the year in London. Over the past 12 years, at this time, from China Town to Charing Cross, from Leicester Square to Trafalgar Square, hundreds of thousands of people have joined in the revels, creating the biggest Chinese New Year celebration outside of Asia. Spring Festival has also become more than just a Chinese festival. 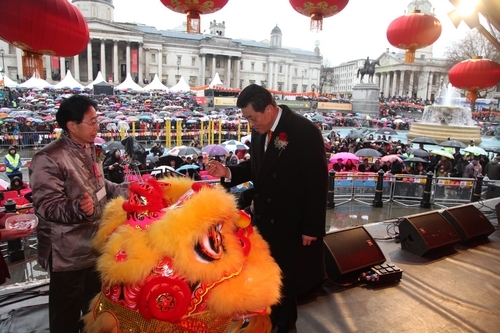 The New Year Celebrations at the Trafalgar Square is now a carnival for both Chinese and British people. This celebration has become a main attraction of Chinatown, of Greater London and all of Britain. It is a success story of China-UK cultural exchanges. Ambassador Liu then thanked the artists from the Chinese Culture Ensemble and Happy Spring Festival Ensemble. They have traveled a long way to bring amazing performances of original Chinese flavour. He also thanked the London Chinatown Chinese Association, Greater London Authority and Westminster City Council for their hard work over the past 12 years and important contributions to create a closer cultural relations between China and UK and a stronger friendship between Chinese and British people. 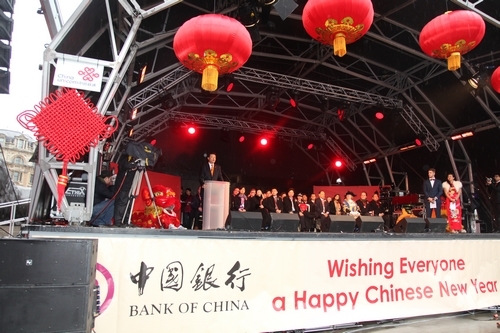 The British officials attending the Celebrations expressed their best wishes for the Chinese people and the Chinese communities in the UK, noting that the Chinese communities in London are the glories of London making unique contributions to local economic development, cultural prosperity and ethnic fusion. Their wish for the celebrations of the Chinese Spring Festival is that it may continue to play a positive role in promoting London’s openness, diversity and prosperity. They also wished that the Chinese communities may make greater development while bringing in good fortune, joviality and development to London. 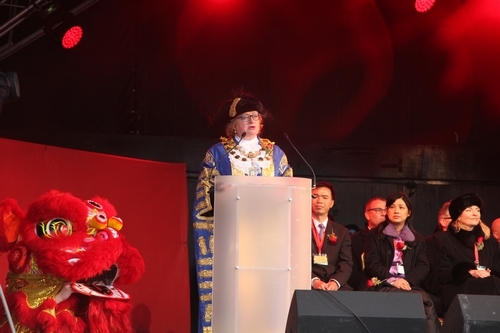 Video blessings from Mayor Boris Johnson of London and He Yafei, Deputy Head of Overseas Chinese Affairs Office of the State Council of China were also played at the Opening Ceremony. Before the theatrical performance began, Ambassador Liu and other distinguished guests followed the Chinese custom of painting on the pupils of the lion, praying for good fortune. After that, the performance began with high-pole lion dance and dragon dance. Art troupes of “Cultures of China, Festival of Spring” and“Happy Spring Festival” joined hands with local artists to stage a unique cultural feast. The opening dance of “Raising Red Lanterns” quickly enhanced the festive atmosphere. The Pipa performances of “Pinghu Lake and Autumn Moon” and “Ambush on All Sides” were full of Chinese national characteristics, the acrobatic performance was amazing, and the Shao Lin Kong Fu performance of “Zen Charm” displayed the vigour of Chinese martial arts. The performance received warm applause from the audience and lasted from noon to evening. Throughout the celebrations, the square and the neighbouring streets were crowded with people, and the gentle rain seemed to be blown away by the resounding Chinese rhythms and the strong New Year atmosphere. 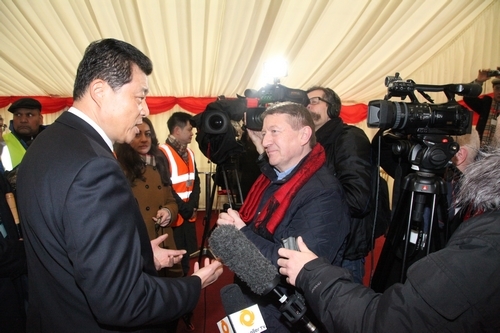 After the Opening Ceremony, Ambassador Liu received live interviews with Sky News, BBC China, BBC Arabia, CCTV Channel 4 and Channel 9 and Phoenix TV, during which he took the opportunity to wish a happy new year to both the people of China and the UK.